It is too dang cold! Lemme tell ya about my week (since I'm sure you're just dying to hear about it). On Tuesday, we had a Winter (snow) storm. I was sent home from my new job at 1:30 pm. The ride home usually takes me between 35 and 40 minutes. I got in my front door at 3:00 pm. I stayed home Thursday... and waited for the ice. And, I waited... and waited... and waited some more. NO ice?!?! At 5:50 pm (the time I would have been walking through the door after a day at work), the ice started. HELLO!!! That's not exactly "late morning"! Which means I miss a day of work I didn't need to miss... which means I missed a day of pay we desperately did not need to miss! 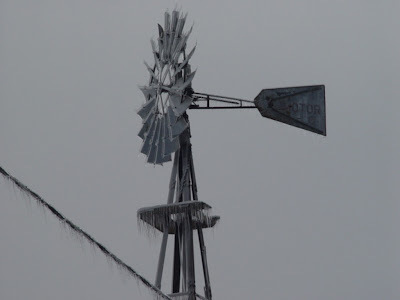 So, the ice storm proceeded throughout Thursday night and into Friday morning. Friday morning, the roads were a solid sheet of ice. Finally, after fretting about how we could not afford for me to miss more work, Hubs took me to work and then visited his great-aunt at the hospital and perused some stores until it was time to pick me up from work. Missouri weather has been crazy all week! And you are right...it is dang cold! It's really cold here, too. I stayed inside all day. The windchill is supposed to be -30° tomorrow morning, so I probably won't even go walking. My cutoff is -20°! Come here...it's cold, but it's warm in my house. brrr...it sure is cold this time of the year. And this marks the season of Christmas. Speaking of which, I found this cool site today, http://www.petcentric.com/crittercarols/?DCMP=RAC-PETC-DogTm-Carol08&HQS=Blog. It allows you to create animated e-cards featuring a chorus of singing and dancing pets that bark or meow your favorite holiday songs. What's more fun is that you can even use your friends' or your own pet's photos. I sent one to my friends, and boy, it was a sure hit!